A MERCEDES Logo has THREE. This photo shows the difference. It helps to know... 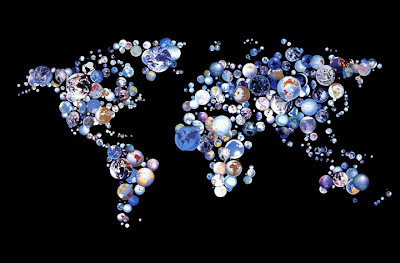 This drawing celebrates Pangea Day, a global communication event, which happened January 17, 2008 and was broadcast May 10, 2008. PANGEA is the name of the single continent all land masses came from. this stunning signed poster, "A WORLD OF WORLDS"
for any contribution of $30.00 US to CHALK4PEACE. from 1994 can't help but make you think about the World. His is a global vision. 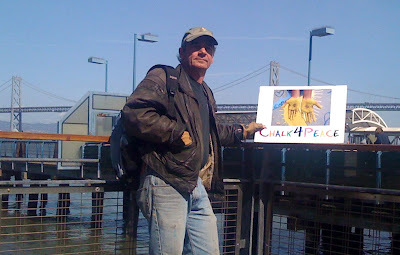 He is a driving force who documents the bliss of CHALK4PEACE. 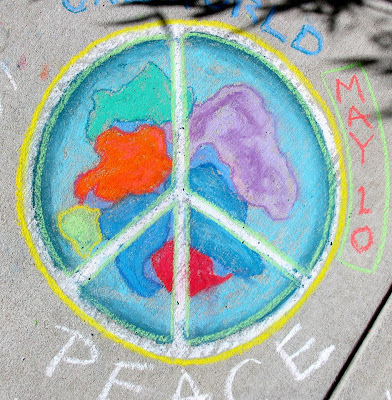 Let Jerry share A WORLD OF WORLDS with you..
JUMP FOR JOY...tell your friends...CHALK4PEACE is coming...again! These artists at Cragmont Elementary School in Berkeley, California, one of the first sites, will be at it again this coming September. Jerry Downs' camera will be there too! 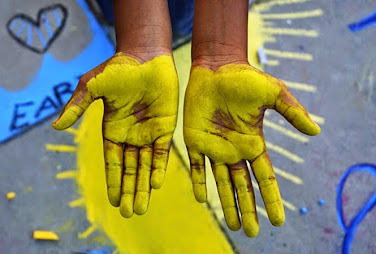 Cape Town Gets Ready to CHALK!!!! Africa. 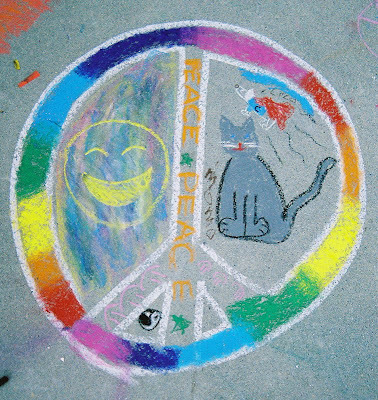 This is their third year participating in CHALK4PEACE. 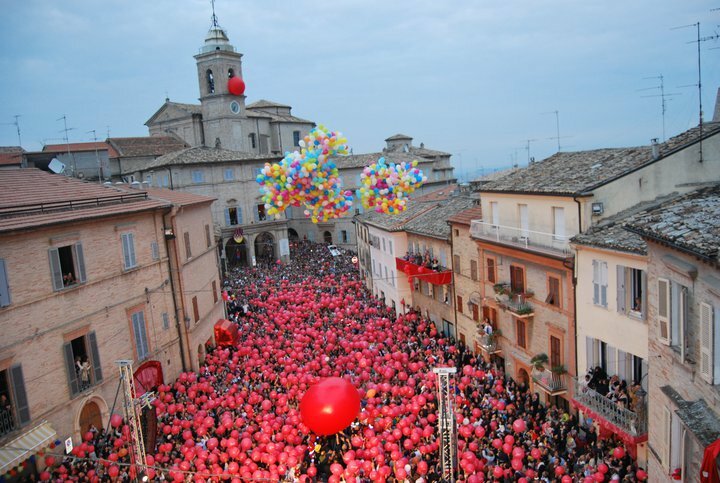 be a part of this worldwide event. Some folks have trouble getting down to the drawing surface. 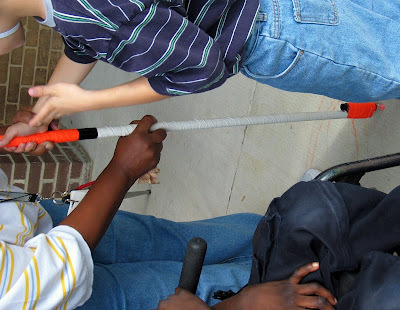 tools so that we may provide them for schools upon request. (VARC) on the Sixth Floor of ARTOMATIC in Washington, DC. up and getting us Rocking..and everybody CHALKING! more than a dozen Beltway schools this September! YOU CAN MAKE IT TWO DOZEN! 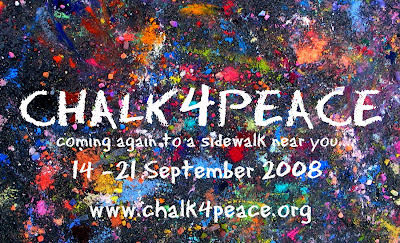 CHALK4PEACE: 4 MONTHS TIL WE CHALK ON! wandered down to the Pier. He took this picture with his IPhone. peace symbols that are some of the most beautiful we have seen. forms with the colors of peace. with more than one hundred artists!